The life insurance landscape in Canada is quite unique. The infographic below shows all the key players and their size, reflecting their assets under management (AUM) based on life and wealth segments of the company’s business. 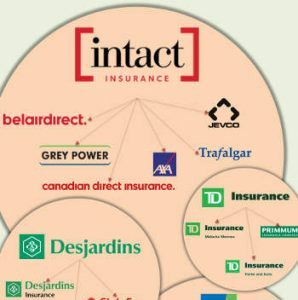 In Canada, the majority of insurers fall under the umbrellas of three large companies: Manulife Financial (also owns John Hancock and other companies in the United States) Sun Life Financial and Great-West Life. These companies are involved in all aspects of life, business, health and group insurance, and they also handle wealth management and pension plan administration. Some of the various companies are also involved in banking. Remember, this is an industry that changes rapidly, so this list may change from time to time. If you are searching for affordable life insurance or disability insurance, our brokers are happy to assist you by providing a quote, or by simply answering any of your questions. We thank nomedicallifeisurance.ca – a leading Canadian website for no medical life insurance for this infographic. Searching for a similar overview of property and casualty insurance companies in Canada? You can find it here (or by clicking on the picture).